I’ve said it (many times) before and I’m saying it again now: I love Laxmi Chhaya. And I *totally heart* this new Tom dvd compilation which contains 23 songs featuring her in all her versatile and gorgeous glory. 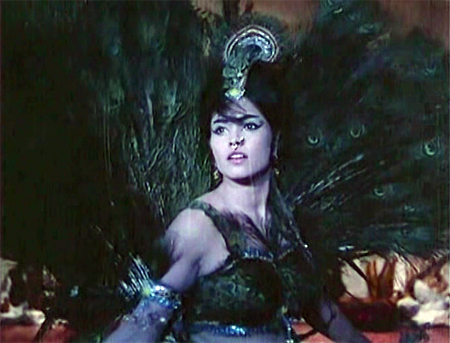 From a simple love song which showcases her girl-next-door brand of beauty, to the crazy “Jaan Pehchaan Ho” and Peacock-Cobra danceoff with Madhumati, plus everything in between (tribal, cabaret, mujra)—it’s all here. And you will never see these songs in better quality, never. I am blown away by this dvd, and I’m even getting used to Tom’s magic. Other artists who appear on here with Laxmi include (but are not limited to) Bela Bose, Yogeeta Bali, Johnny Walker, Shyam Kumar, Jeevan Kala, and our very own Ted Lyons & His Cubs. The songs are all subtitled (you can turn them off if you don’t need them) beautifully by Ava and Raja. But really all that matters is the fabulousness that is Laxmi herself, with that flashing smile, lovely face and absolutely adorable personality. Instructions for accessing it are in this pdf and as always help is available if you leave a comment asking for it. Mad props to Tom and subtitlers Ava and Raja for putting it all together! Enjoy! I just know Laxmi would want you to. Posted on August 11, 2010 at 9:08 am in Hindi movies	| RSS feed You can skip to the end and leave a reply. Yes!!! I am the first to comment on memsaab’s blog ever!!!!!!!!! The DVD seems to be very nice. Long Live Tom !! 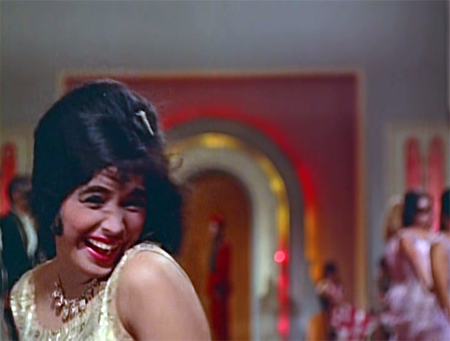 !..Long Live Memsaab and of course Ava and Raja…!!! All of you thanks a lot. Greatly appreciated!! Well i am downloading this now…!! Can’t wait anymore!!!!!! Love Laxmi always where in bonus getting Bela, Shyam and Madhumati in bonus!!! 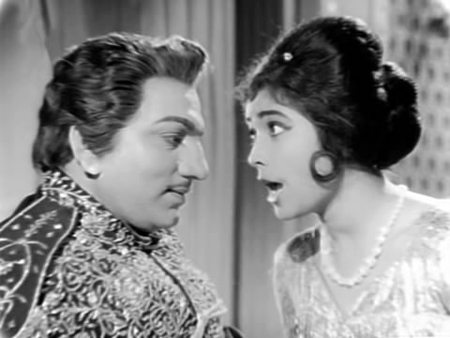 tu hi meri laxmi tu meri chhaya	tu hi meri chaaya, duniya mein aaya toh tere liye aaya, o laxmi chaaya -Mohammed Rafi , MD Shankar, Jaikishen – Lyrics	Hasrat Jaipuri and the phillum Duniya 1968. G8 effort, lotsa devotion of the full crew, keep up yr good work and thumbs up. Seriously, it IS a real treat. 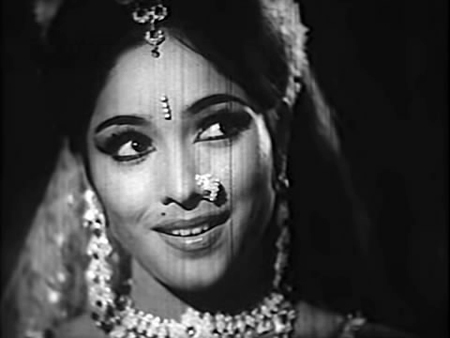 The video quality is superb and Laxmi is just so talented and wonderful, along with all the others here too :) Great songs and dances, and a nice variety I think. 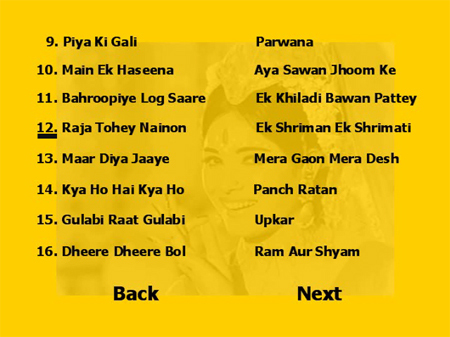 Like Tom, I love the other song from Mera Gaon Mera Desh – Hai Sharmaon more. Main ek Haseena is my own top choice. Gulaabi Raat Gulaabi is right up there for me too…oh who am I kidding? I can’t pick a favorite. Well, Jaan Pehchaan Ho has to be although I know it’s predictable :) Other than that, it can change from day to day! Great! Can’t wait to add this one to the others already done by Tom and crew. 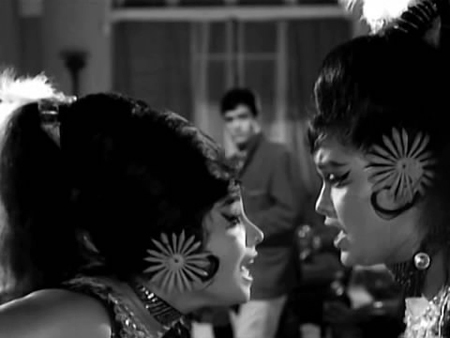 Its hard to choose a favorite Laxmi song, but I have to say Do Pal Jo Teri which pairs her with the great Bela Bose. They had excellent chemistry together in that song. 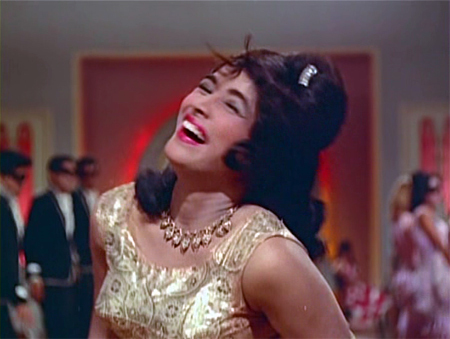 Although she could dance all styles wonderfully with grace, she was also a great comic dancer (Jaan Pehchaan Ho) who was also one of the most beautiful (Maar Diya Jaaye). So fitting that Laxmi was named after a Goddess that is the embodiment of beauty, grace and charm. Mucho thanks Tom for his hard work in putting this together and also to Ava and Raja for the subtitles. And, of course, to memsaab. I was already a MASSIVE Laxmi fan before I started doing/checking sub-titles for her songs on this DVD. And I loved each one of them!!! Like Tom and I discussed over e-mail, there is just SO much goodness in Laxmi songs that you keep songs out of a DVD with utmost reluctance. She had that smile that could light up an entire room, that sparkle that no wine can quite match, those head and hand-jerking dance movements that made you want to jump out of your chair and join her on the floor…. I am SO glad that Tom has put together this DVD on her. This is the least she deserves, considering the amount of enjoyment she has given all of us. She came, she saw, she conquered….our hearts. A word for the quality of the DVD itself. You have to see the original video clips to get a sense of what a fantastic job Tom has done with some of these songs. When I was subbing some songs, I was not too thrilled about the video quality but Tom assured me that the final quality on DVD would be much better. And he is true to his word – there is a world of difference I see. So HUGE kudos to Tom for this mind-blowing effort! I hope a lot of people download this and enjoy the songs. Laxmi deserves to be known much more than she is. This is our way of paying tribute to her. Thanks to Greta too for putting this up. And Ava for fantastic translation of the songs that she did. I must admit that I struggled quite a bit with “Piya Ki Gali” but Ava just walked through it. :-) Always good to have somebody who can help you out if you get stuck. If any of the subs are not quite right, my apologies. I tried to convey the meaning as best I could but sometimes things do get lost in translation. p.s – doesn’t she have the sweetest smile?? Waah waah waah, that is great. And all those who made it possible deserve our heartiest of thanks. 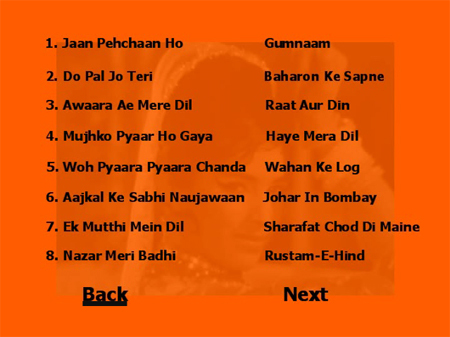 We may not be realising it, but the people who are making these songs available in such quality with sub titles etc are doing a great service for the cause of old Bollywood movies in general and these arists in particular. Artists like Laxmi Chhaayaa, who did not get proper acknowledgement during their active days are finally getting their well deserved recognition thanks to people like Greta,Tom,Raja,Ava, etc. Kudos to them all for their online collaboration to make such magical things possible. Many thanks for sharing the info. about this new DVD Memsaab. Huge thanks also to Tom, Ava & Raja for their combined efforts in making this all possible. Hope you enjoyed them & looking forward to your reviews. I am really honored that Tom asked me to annouce this—as Raja said above, Laxmi deserves nothing less! She really *does* have the sweetest smile. I’m going to need to find my thesaurus because I am running out of superlatives to describe the great work that you all are doing! Please accept my humble thanks and above all (since I’m greedy) keep up the great work! Hey memsaab, I have seen the pdf doc that is a delight to read in itself. However Q – from where do i download this DVD? I mean is there a url link or particular site where i need to go? Sorry for the dumb question but need help coz as u know I am a big fan of Lakshmi Chayya like you! The link is at the very very end of the pdf file :) The VERY LAST thing. he readily agreed once i get a reply from u! sharing this treasure with us. It says:NOTICE: No servers are currently available with the required data on them. Please retry your request in a moment. I’ll ask Tom to look into it, thanks for letting us know…glad the rest of it was faster than usual :) The universe is catching on, maybe! Yes, I just tested it and Suzanne is correct. This happened with a Bela Bose RAR (not even a PAR file) and it took a couple of days for it to return. My first suggestion is to try to repair the RAR files with what you have by following what it says in the included Instructions.pdf (let us know how you get on because I’ve never tried with incomplete PAR files). Failing that, I’ll keep an eye on it and replace the PAR file tomorrow if it doesn’t become available before then. I’ll report one way or another below your comment. Wah wah! Great products AND great service! I’ll give it a try either tonight while I’m at work or first thing in the morning. I’ll post here with the results. Thanks so much for your prompt response. Wow! This looks fab. But am still facing glitches with download. Does one have to download the software from mediafire first, before the files open. Banno, if you’ve not installed that software you most likely will need it, especially the QuickPar program which ‘repairs’ the sometimes corrupted RAR files. Maybe none are corrupted, but the several times I’ve tested, I always needed QuickPar. WinRAR is needed to extract the ISO out of the RARs, although other programs can be used. And ImgBurn is needed to burn the ISO to DVDR, although other programs can be used. If you follow the directions in the Instructions.pdf, you can’t go wrong. Banno also if you look at the Bela dvd comment thread, another evolved Apple person added some tips on working with the files on a Mac ;-) It really is worth downloading…you will have a treasure! BTW, Teja is working at the Shemaroo DI facilities these days, color correcting his latest feature film. And he’s on pretty good terms with them. You mean SHAMEroo? Well, no messages unless he is ready to be banned from the facilities :) Although if he wants a job with them working on fixing problems in their film inventory I would wholeheartedly endorse it! Tom, Is there any site where I can watch the videos without downloading, your Veoh site? 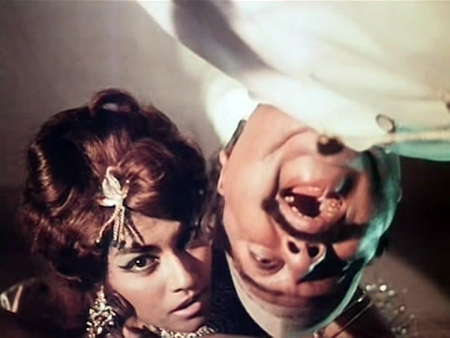 Banno, as mentioned in the Laxmi Chhaya.pdf, all the videos included in the DVD (and more) are available for viewing on my DailyMotion channel (link also in the Laxmi.pdf). Just do a search on ‘Laxmi Chhaya’ and they’ll all show up. But they won’t be nearly the same quality as in the DVD. You want the DVD, I think. Oh, there are also quite a few at the Veoh site, but not as many as at Dailymotion, and not as many with subs. Quick update. I created the iso file, but since I’m at work and using LogMeIn to access my home computer, I can’t burn it and test it until the morning. However, I had no issues whatsoever, in fact, none of the files even needed to be repaired. I’ll update when I get home in the morning, but it looks good. The iso file is 4.36GB, so I’m sure it’s fine. I’m glad to help out in a small way. And for anyone who isn’t tech savvy – the directions in the pdf are excellent and easy to follow (with pictures and everything)! It really is painless and the results are fantastic. I add my thanks :) Glad you’ve got it—the results really ARE fantastic. I burned it this morning and I’ve watched it twice. :) Once on the PC using Windows Media Player and once on my stand alone player on the 42″ TV. It worked fine both times and looks great even on the large TV. Tom has worked miracles with the video. And the missing file didn’t have any effect at all. I got no errors. And it is well worth the effort! I also want to point out what a joy it is to read Tom’s well written and thoughtful essays that go along with each DVD. Thanks again to all involved! For what it’s worth, that missing PAR file is now available again. However, based on your experience, Suzanne, I might recommend downloading everything but the PAR files and going directly to WinRAR to convert the RAR files to ISO for burning to disc. Only if WinRAR reports a corrupt file would I then go back and get all the PAR files and go through the whole QuickPAR procedure as outlined in the Instructions.pdf. If it works, it’ll save a lot of time downloading and some time by not having to do the QuickPAR thing. Ever since I learned how to download the files I was waiting for another opportunity and what a fine one of Laxmi Chaaya. This song is on the Johny Walker DVD compiled by Tom. 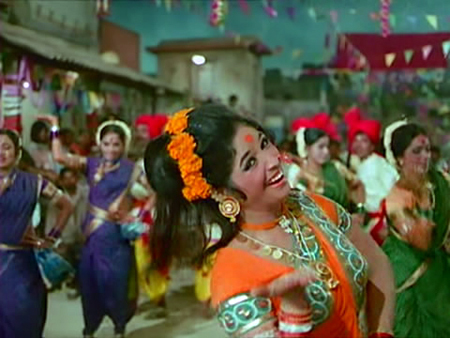 Dancing was in Helen’s blood, now why am I writing about Helen when this is about Laxmi Chaya? Well if you look closely at ‘Jaan PehchaanHo’, you will notice Helen involuntarily shaking her body and shoulders to the rhythm of the music. Everyone noticed it when the scene was being shot. 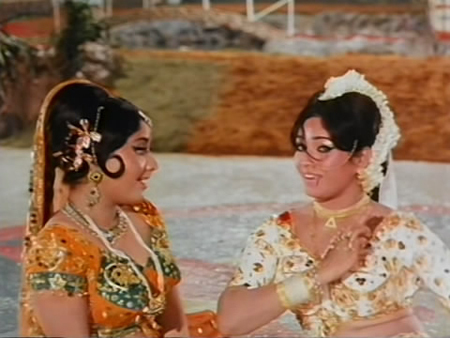 Came across this Laxmi song today from Do Phool (1974). Laxmi AND (probably) fake sheikhs!!! Too fabulous for words :) Another film I must procure! Over the weekend I successfully downloaded and burned a DVD. The result is just superb. This time round there were no broken files and so there was no repairing. Everything went smoothly. I’m enjoying the DVD very much. Maybe I am dense but I see no access info in the PDF. which page should I look for? Never mind. I get it now. The things at the end are links. Just watched this a couple times now. Many thanks! The cobra v. peacock battle is something else, as is the long playlet. I thik I wouldn’t have recognized her in about half of those numbers, a change in wig can really affect how she looks .